Pork chops and mustard has always been one of my favorite flavor combinations. This recipes, with a little planning, is incredibly quick and easy for a healthy salad packed full of delicious flavor. The sous-vide pork is juicy and always perfect cooked because of the constant temperature and once the pork is done everything comes together in minutes for a easy and delicious meal. Preheat a bucket of water to 140 degrees using a sous vide machine. Put the pork chop, shallot, rosemary, garlic, salt and pepper in a vacuum sealed bag. Seal the bag completely. Place the bag into the water and let cook for 1-2 hours. After the pork is cooked remove from the water, drain the bag of the liquid and discard the non-pork ingredients. Pat dry the pork with a paper towel. Preheat a large cast iron pan over high heat adding the vegetable oil. Add the pork to the pan and cook without moving for 45 seconds to 1 minute and 15 seconds. Flip the pork, add the butter and swirl the butter to make sure swirl the butter so it reaches all parts of the pork. Cook for another 45 seconds. Using tongues, hold the pork and sear the fat cap on all sides. About 20-30 seconds a side. Remove the pork from the pan to a plate, cover with foil and let rest for 2-3 minutes. Remove the meat from the bone, slicing perpendicular to the fat cap into roughly bite-sized pieces. While the pork is cooking prepare the dressing and salads. Combine all the ingredients of the dressing in a dressing container or mason jar. Shake the container vigorously to combine all ingredients and emulsify. Taste the dressing for adequate seasoning and adjust as necessary. Wash and dry greens adding them to plates. Chop the radishes and pepper and add them to the greens. 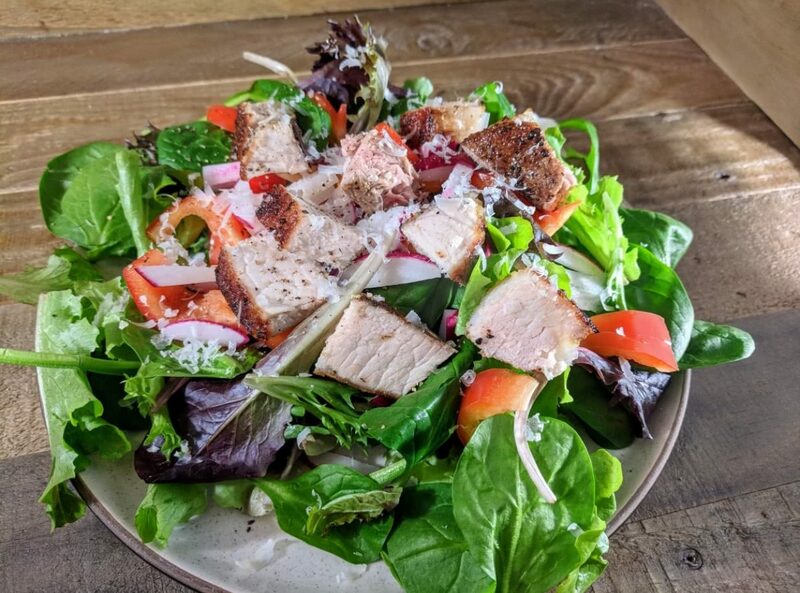 Add chopped pork chops to the top of the salad. Drizzle dressing over the salad as desired.